When I shoot on the street I like to have a plan - not that I have to follow that plan, but I feel that it is good to have a starting point for what I am doing. Going to New York City can be - scratch that - "is" overwhelming. The first half hour of my visit is seldom productive. My mind is working faster than my body, and taking it all in is just not possible. Finally I settle down and start narrowing things to the point where I am able to start working productively. I assess the location and think about how it affects me, and how I should photograph it to reflect that. 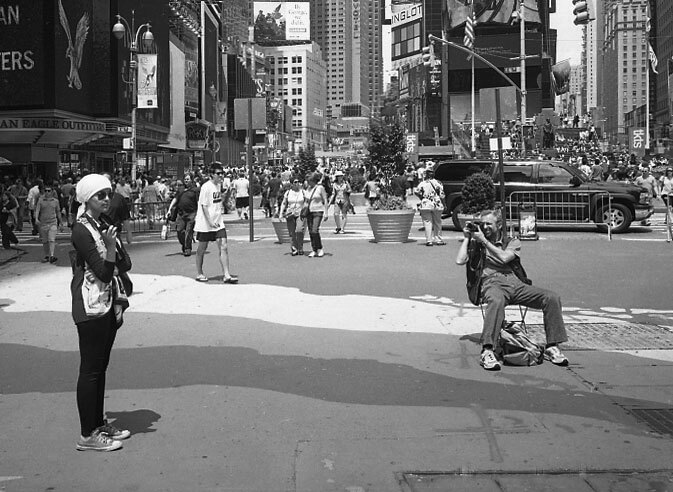 An example is Times Square, the easiest place in the world to enjoy street photography. Information overload is the first thing that jumps out, so I look for examples of that overload in how people are acting. The sidewalks and street corners are bustling so I look for examples of these crowds and how people work with one another within the crowds. There are numerous people dressed up as cartoon characters or naked cowboys (or cowgirls) so I like to get behind them and photograph the people photographing them. New Yorkers sometimes sit at the tables in the square and eat, relax, or hawk theater tickets, so I photograph them that way. When done, I am hoping to come away with a documentation of people's lives in the context of their environment. We think of street photography in terms of walking around, and certainly that is a major part of it. However, there are times when a particular location is begging to be augmented by a person, and I think of that as finding a stage - I also think of it as a welcome relief for my legs. When an interesting stage has been found it makes sense to prepare the shot and wait for a person to enter the stage to complete the scene. If you wait long enough then you can have an engaging background as well as a choice of people from which to select in the final editing process. Finally, I like to have a piece of paper that lists several things that I may have forgotten about that could spark my imagination. There is nothing special about this list, but it allows me to look for things that I might otherwise not have thought about. Do I see silhouettes that might show some mystery? Are there people that appear in the context of an object nearby that either draw them together or act as opposites? Is the light doing something interesting that can be tied into the actions of the people? Do the shadows form something suggestive that can fit within the frame? Are there reflections that offer attractive contrasts of multiple objects? Can I find interactions between people that may be curious? Should I allow movement to show in the image? Street photography can be a captivating means of photographing people, but can also throw one into a rut if they are looking to photograph in a single direction. When I feel that my mind is dried up of ideas in a particular location I pull out that piece of paper (actually, I laminated it so that I do not have to reprint it each time) and go through the list. Others will have their own list that draws from their own experiences, but the key is to have a plan for what you want, and be ready to deviate from it if circumstances dictate.